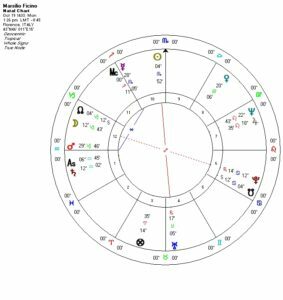 The Early Renaissance in Florence was a turning point in Western thinking and culture – and anticipates much in modern astrology. It was a remarkable time but more complex, contradictory, and chaotic than what we learned about in school. This course will explore some of its chaos and contradiction. Marsilio Ficino was a major player during this time, the main translator of and commentator on recently-available philosophical texts from antiquity. His mixture of traditional astrology and medicine, Christian religion, Neo-platonism, and paganism helped launch the Italian Renaissance. Most important to is that he also used sympathetic magic and astrology to support the health and flourishing of body and soul. Book 3 of his Three Books on Life, “On Obtaining Life from the Heavens” uses astrology to help cultivate the good life here and now. We’ll look closely at this work, at a planetary symbolism that fused astrology and ancient mythology and their applications to daily life, also to art and music. This also gives us the opportunity to look closely at general issues of electional astrology and ritual timing. Coinciding with the life of Ficino were some of the major characters of the Renaissance: Lorenzo de Medici, Sandro Botticelli, Pico della Mirandola, and, more tragically, the friar Savonarola. We’ll look at these people, including their astrology, and their connections with Ficino. Hello, Will you be repeating this course later in 2018 or in 2019? I just saw it now (Sept 2018) and haven’t mastered that time travel bit yet….Thanks!